Many injured and healthy runners use an elliptical machine to reduce the impact on joints, muscles and tendons while maintaining the running motion as closely as possible. An elliptical is a practical alternative and available to most people. It’s purpose is to do just what these runners are looking for. Long term use of an elliptical can have a negative impact on your running, however. If you’ve ever used an elliptical for over an hour, you’ll notice it starts to make your toes feel numb. The position of your body is different on the elliptical compared to when running. What are the body position differences? First, on the elliptical both feet are always making contact with the “ground.” When running one foot is in the air while the other is stabilizing you. The second difference is your hip extension. When you are running your back leg straightens out more than on an elliptical and it is farther back pulling your hips back as well. On the elliptical, your knee stays bent because your foot continues to be in contact with the ground. This is problematic because a lack of hip extension leads to injuries and inefficient running. Thus, the elliptical does not develop the neuromuscular connection required for a strong efficient form when running. Another issue is it doesn’t require you to use the stabilizing tendons and muscles of your ankles causing them to become weaker and damaging the neuromuscular connection here as well. Then there is the hamstrings, because the elliptical limits hip extension it doesn’t engage your hamstrings very well. Weak hamstrings impact your ability to climb and cause an imbalance of muscles. The hamstring works to balance your quadriceps. They slow down the forward movement of your leg. Wow with so many disadvantages, why use an elliptical when injured? Because it lowers the impact. There are other advantages as well. It burns close to the same number of calories as running. It maintains your cardiovascular fitness, and gives more of a total body workout if you use your arms. There is the options of both forward motion and backward motion with your legs, giving you some cross training due to the different muscles used. Many people work harder on an elliptical than they do when running because the perceived exertion is less on an elliptical. Finally, it’s easy and safe to use. The take-away? 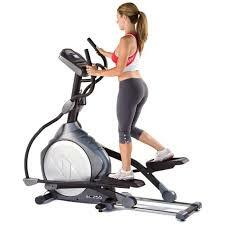 An elliptical is a good alternative to running when injuries or to be used as cross training in addition to running. However, exclusive use of one to train for running, especially long term will compromise your form and lead to injuries. If I may add a comment to use caution and not get competitive on the machine. Some people see a counter and there is the natural tendency to go for it. I am one of those who thought that more was better. In the span of one hour I was able to do 9,945 strides. It took about a week after the overuse that it was a trigger to a hidden problem of a weak trap muscle across the shoulder. It was not long that I was having pain in the shoulder and neck area. The problem was so bad that I was not able to run for 3 months because the swinging of the arms was painful. It has taken 2 months of therapy to relieve some of the pain to where I can run. The caution is not to work the upper bottom as much as I did. I did get value when it is done but in moderation. The best way to use is not keeping track of your strides but your effort. Be safe and enjoy. Interesting read. I have a mild case of PF in my right heel and am debating whether or not to take time off running to let it heel ( I dread this as I NEED to run!). I am stretching a lot and icing when I need it and rolling a ball under my arch when sitting. Do you think I should stop running for it to heal?Any tips? I am doing the stationary bike. Would the eliptical help or worsen it? Putting your running on hold is going to allow it to heal faster, but I understand the NEED, so reduce your miles. Try heat before the run, ice after, and lots of stretching. Wearing a strassburg sock at night really helps.